In 1986 the U.S Mint began producing Proof Gold American Eagles with the same design depicted by Augustus Saint-Gaudens, was selected as the design that would grace these beautiful Coins. The Saint-Gaudens design first appeared on the United States' $20, or double-eagle, gold piece in 1907, where it remained until 1933. Like their gold counterparts, American Eagle Silver Coins have been produced and sold in both proof and bullion finishes since 1986. They have always featured a rendition of sculptor Adolph A. Weinman's magnificent Walking Liberty design, originally prepared and executed for the Nation’s first circulating half-dollar coin in 1916. 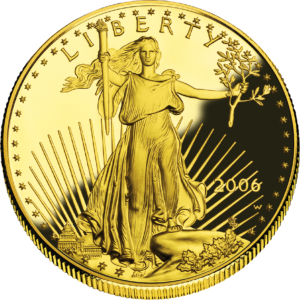 The United States Mint produces proof versions of American Eagle Bullion coins for collectors. American Eagle Proof Coins undergo a specialized minting process, which begins by manually feeding burnished coin blanks into presses fitted with special dies. The coin is struck multiple times so the softly frosted, yet detailed images seem to float above a mirror-like field giving them a cameo type appearance. After scrutiny by white gloved inspectors, each American Eagle gold coin is sealed in a protective plastic capsule and mounted in a handsome satin-lined velvet presentation case with its own official Certificate of Authenticity. Since American Eagle Proof Coins are produced by the United States Mint, each coin's content, weight and purity are guaranteed by the United States Government. American Eagle Gold Proof Coins have a limited minting.